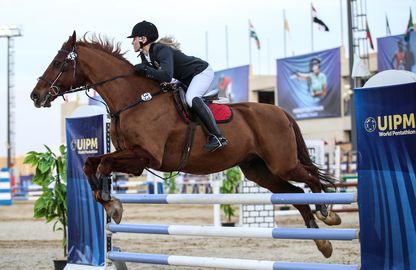 Elodie Clouvel (France) opened the 2018 season in style with a commanding victory in the Women's Individual Final at UIPM 2018 Pentathlon World Cup Cairo. The Rio 2016 Olympic silver medallist performed consistently throughout the day and immediately took control of the Laser-Run after starting 1sec behind the leader, Iryna Khokhlova (Argentina). 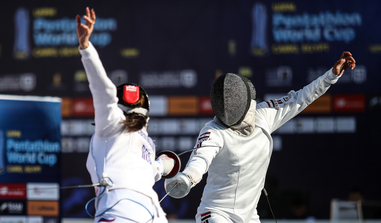 In the end, Tamara Alekszejev (Hungary) also overtook Khokhlova (ARG) to claim silver while Ilke Ozyuksel (Turkey) tore through the pack from 14th place to claim bronze in the opening final of the UIPM Modern Pentathlon season. Gintare Venckauskaite (Lithuania) also had a superb Laser-Run and finished 4th, pushing Khokhlova (ARG) into 5th. Ekaterina Khuraskina (Russia) crossed the line in 6th and there were notable Laser-Run performances from Rio 2016 Olympic champion Chloe Esposito (Australia), 2017 world champion Gulnaz Gubaydullina (Russia) and Anastasiya Prokopenko (Belarus) in the next three places. Clouvel (FRA) said: “I am very happy and this feels like my comeback, because last year for me was not very good in training. “This year I started training very hard with my team, and I am so happy. My best part was the Laser-Run, because in my head I knew I was strong from all the hard training. The day began well for the most decorated athletes in the field, as Gubaydullina (RUS) swam fastest in 2:09.16 ahead of Clouvel (FRA) in 2:10.98 and Esposito (AUS), competing in her first major competition since the Rio Olympic Games 18 months ago, in 2:14.21. The Fencing hall was where Khokhlova (ARG) made her mark, with a superb round robin of 27V/8D. Alekszejev (HUN) managed 25V/10D, the same as Janine Kohlmann (Germany) and Ieva Serapinaite (LTU), while Clouvel (FRA) stayed in touch with 22V/13D but Gubaydullina (RUS) and Esposito (AUS) struggled. In the Bonus Round, Clouvel (FRA) scored a couple of victories but it was Kohlmann (GER) who advanced on the leaderboard by winning the final three bouts. Five athletes managed a clean round for a maximum 300 points, including team-mates Sive Brassil and Eilidh Prise (Ireland). The others with a perfect score were Ozyuksel (TUR), Zinayida Batrak (Ukraine) and Manon Barbaza (France). Clouvel (FRA) maintained her composure once again to score 293, the same as Esposito (AUS), Khokhlova (ARG) and Alekszejev (HUN), but the challenge of Kohlmann (GER) ended as she was eliminated. Clouvel (FRA) started on the shoulder of Khokhlova (ARG) and immediately moved past her on the first running lap, while Alekszejev (HUN) and Serapinaite (LTU) protected their positions. Ozyuksel (TUR) set an incredible pace and moved up to 4th on the second lap, having started 59secs behind the leader, while Esposito (AUS) moved up the field too. 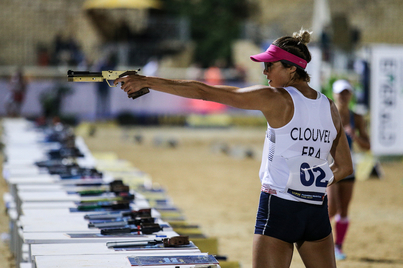 Clouvel (FRA) kept her nerves under control at the range to build a dominant lead, while Venckauskaite (LTU) made huge progress on the third lap and 2017 World Cup Final winner Alekszejev (HUN) moved closer to silver. On the final lap, Khokhlova (ARG) saw her medal bid fall just short as she was caught by the impressive Ozyuksel (TUR), who even came within 2secs of catching Alekszejev (HUN). Janusz Peciak (POL), the 1976 Olympic champion and UIPM Executive Board Member for Sport, said: “Today we enjoyed a wonderful start to the UIPM season with fierce competition between athletes from all continents. “Elodie Clouvel proved her class yet again and there were a number of impressive performances from athletes who have worked hard throughout the winter for this moment. 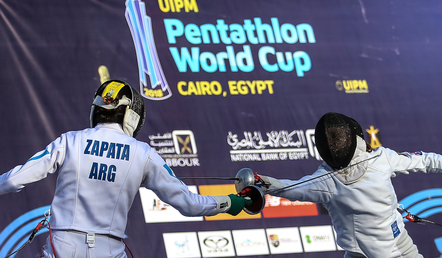 UIPM 2018 Pentathlon World Cup Cairo continues tomorrow (March 3) with the Men’s Final before the Mixed Relay concludes the competition on March 4.